Set in 2150 -- in a world of automatic cars, nightclubs with auditory ecstasy drugs, and guys with four arms -- this is about the human genetic "mistakes" that society wants to forget, and the way that outcasts can turn out to be heroes. When their overprotective father is killed in a terrible accident, Zel and her younger sister, Dylia, are lost in grief. But it's not until strangers appear, using bizarre sensory weapons, that the life they had is truly eviscerated. Zel ends up in a safe house for teens that aren't like any she's ever seen -- teens who, by law, shouldn't even exist. One of them -- an angry tattooed boy haunted by tragedy -- can help Zel reunite with her sister. But only if she is willing to lose him. Control is a difficult book to review. I enjoyed it but it didn’t grab me and pull me in the way I’d hoped it would. The pacing, especially in the first half of the book, was slow. The characters were hard to connect to. And though the plot was fascinating, I had trouble understanding some of the scientific mojo, which left me confused and lost for a good portion of the book. For the most part, I liked Zelia. She was an interesting character, very headstrong and stubborn. She was incredibly loyal to her sister, but sometimes that caused her to make stupid decisions. I really wanted to reach through the book and shake some sense into her! Though I liked that she was a take-charge person and refused to sit on the sidelines and let others do her dirty work, I also think her hastiness cost her more than it gained her. If she had slowed down and enlisted help, things might have turned out differently. In the first half of the book, Cy annoyed the crap out of me. He was so mean to Zelia, though not without his reasons, I suppose. But he kind of reminded me of Arin from The Winner’s Curse. I wanted to like him so much, but his attitude and the way he treated Zelia.. Nope. But then in the second half of the book, he started to change and open up more. He treated Zelia better and, wow, major swoons and all the feels! Dylia was.. Well, honestly, she was a brat and it felt like her only role was to be a pawn who set the book’s events into motion. There didn’t seem to be any other purpose for her. I’m hoping we see more of her in Catalyst and that she gets a bigger role, so we can see more of her personality. I’m hoping for a lot of character growth with her. There was a huge cast of secondary characters in this book. In the beginning, it was impossible to keep track of them. I had to write their names down with their traits and my initial feelings. I pictured Hex as the protective big brother of the group. Oddly enough, I saw him as Kellan Lutz, a.k.a Emmet Cullen. Except with four arms. Initially, I liked Wilbert. He was a bit immature, but nice, smart and reliable. He reminded me of the kid brother of the group. But then the ending… Wow. Didn’t see that coming! I really liked Vera, though she was cold and bratty in the beginning. By the middle/end, she calms down and cools off and I really like her. Finally, I never fully trusted Marka. She almost seemed too perfect, like she was trying too hard in an attempt to hide something. I think one of my favorite characters was Ana. I’d love to see more of her story in Catalyst! Then there’s Micah. I don’t even know if I can talk about Micah without getting all ragey. I absolutely adored him and then.. Ugh. I can’t, spoilers. But when you read it, you’ll know. The best I can do is compare him to Maven from Red Queen, so if you’ve read that, you know why I’m filled with rage. There are a few more characters that I couldn’t stand – like Zelia’s father, SunAj, the whole Aureus crew.. But really, there’s not much to say except that they were evil and horrible and I can’t stand them. So that’s that. The only other thing I have to say is, Zelia’s dad might have thought he was protecting his daughters… But he really went about it the wrong way and probably made things a whole lot worse. As I mentioned, the pacing was very slow, especially in the first half of the book. Though I read the first half very quickly, it still seemed to drag. Then it took me days to really get into the second half, though the second half picked up a lot. The weirdest thing, though, was that once I started reading, I was fine and could read huge chunks in one sitting. But once I put the book down, I didn’t really want to pick it up again and sometimes went days without reading. There was a lot of scientific talk that I didn’t understand at all. I don’t think Kang could have dumbed it down at all, because it seemed like most of it was as basic as it could get. Maybe it was just me, but I just couldn’t understand it and that distracted me from the overall story. The plot was definitely fascinating and, above all else, it was what kept me reading. The plot felt like a believable, real thing that could actually happen in our near future. It was both interesting and terrifying to think about. I was desperate to see how it all ended. Plus, there were some epic twists that I didn’t see coming. The end was a bit crazy and disorganized, not to mention a little bit rushed. But it also broke my heart. For just a little while, I was convinced that the characters would get a happily ever after, then Kang yanked the rug out from under me and chaos ensued. 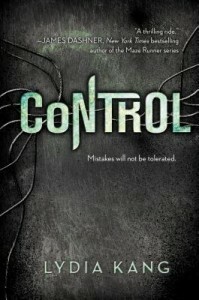 Overall, though the pacing was slow and I had trouble connecting to the characters, I enjoyed Control. The second half of the book picked up enough that I’m interested in reading Catalyst to see what happens to the characters (that I grew to love) and to find out how they get out of the mess they’re in. I’m also dying to see what happens next for Cy, not to mention crossing my fingers for more Zelia + Cy (do they have a ship name?!?!) feels! I would recommend this book to those who like futuristic thrillers with genetic modification and lots of science. If you like that sort of thing, you’ll love Control!